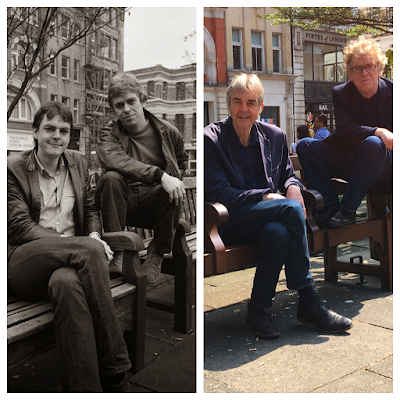 The other day Mark Ellen and I returned to the bench in Golden Square where BBC publicity took our picture in 1982 for Old Grey Whistle Test. We've put the two pictures together to mark the fact that we've taken over next week's essay slot on Radio Three (10:45 every evening from Monday) for something called The Earl Grey Whistle Test. Back in the eighties Mark would joke that we would end up as two old dodderers presenting a programme under that title so we wanted to make good on the gag. Our essays, one joint and four solo, cover such topics as drummers in rock, why rock stars never give up and the unusual sensation of being part of a duo most people can't tell apart. While we're plugging things, Mark and I are appearing at the Harrogate Literary Festival on July 9th with Zoe Howe and Paul Du Noyer. Details here. We're also hosting Word In Your Ear tomorrow night in Islington with Sylvia Patterson and Derek Ridgers. Details here. Was it the same bench? If so it looks like it's been refurbished. As have the blokes sitting on it.